Railway Engineers worldwide were familiar with the Company - Davies & Metcalfe Ltd - formed in 1888 by James Metcalfe, to manufacture and sell his invention, the Exhaust Steam Injector. The company became famous for its Exhaust and Live Steam Injectors and Vacuum Brake Valves and associated equipment, finding customers in every corner of the globe. With the introduction of Electric and Diesel traction it's product range was adapted to suit the introduction of a range of pneumatic and electro-pneumatic braking systems and associated apparatus which is traced together with innovative diversifications. The author chronicles with technical detail the development of the Company and its products over a period of 110 years. 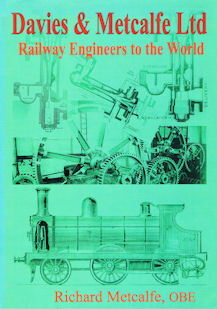 In addition many anecdotes provide a fascinating insight into the development and working of railways and industry world wide, reflecting aspects of a British manufacturing industry and a way of life based on a Victorian style of enterprise which, like so many others, has now disappeared.